(CNN) -- Roger Federer and Novak Djokovic scored comfortable straight sets victories to reach the third round of the Masters 1000 tournament in Miami. Roger Federer was largely untroubled by Kevin Kim in a straight sets victory in Florida. World number two Federer, playing in only his second tournament since his defeat to Rafael Nadal in the Australian Open final, beat American Kevin Kim 6-3 6-2. Djokovic, under pressure from Andy Murray for third spot in the global rankings, beat Canadian Frank Dancevic by the same scoreline. Federer, chasing his first Masters tournament victory in 13 attempts, was pleased with his form in Friday's opener. "I felt good," he told the official Tour Web site. "It was great start to the tournament. I feel like this is an important week for me to do well, especially now that I have matches again under my belt." The 13-time grand slam champion now faces Germany's Nicolas Kiefer, a 5-7 7-6 6-2 winner over Fabrice Santoro of France. Djokovic, the 2007 champion at Key Biscayne, took 70 minutes to beat Dancevic, while fifth-seed Andy Roddick opened his campaign with an easy win over Argentina's Diego Junqueira, dropping just two games in the process. Scot Murray, who beat Federer in the semifinals at Indian Wells last week, can dislodge Djokovic by reaching the final of the current tournament. 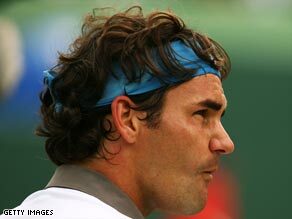 He opens his campaign on Saturday against Juan Monaco while top seed Rafael Nadal is also in action.